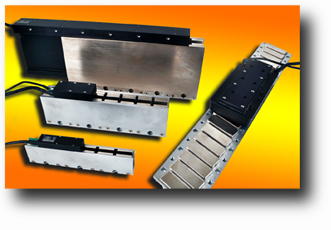 Linear Motion Control – H2W Manufacturers Brushless Linear Motors! Santa Clarita, CA -Linear Motion – With the recent acquisition of the Baldor linear motion product line, H2W Technologies has begun manufacturing brushless linear motors in its Santa Clarita, CA facility. With extensive experience in designing and building custom linear motion systems, and now, with the tooling necessary to produce both ironless and iron-core brushless linear motors, H2W has the capability of offering a complete line of standard and custom brushless linear motors. Ironless brushless linear motors are ideal for long stroke, high speed, closed-loop applications. With a lower moving mass, they operate at speeds up to 240 ips [6 m/s], and can be precisely controlled when coupled with a linear encoder. Zero cogging in brushless linear motors, make them ideal for applications requiring smooth motion at both low and high speeds. H2W can provide motors with precision linear encoders or with hall effect sensors for trapezoidal commutation. Typical applications for the ironless brushless motors include: Inspection, pick-and-place, clean room, robotics, machine tools, coordinate measurement, patient handling, scanning, semiconductor handling, and laser and water-jet cutting. « Motion Control – World’s Smallest Commercially Available Ball Screw!